The outside of what we call “The Granny Flat” doesn’t reveal much about the miracles of modern technology found inside, from the renewable resources to the remarkable rooms. 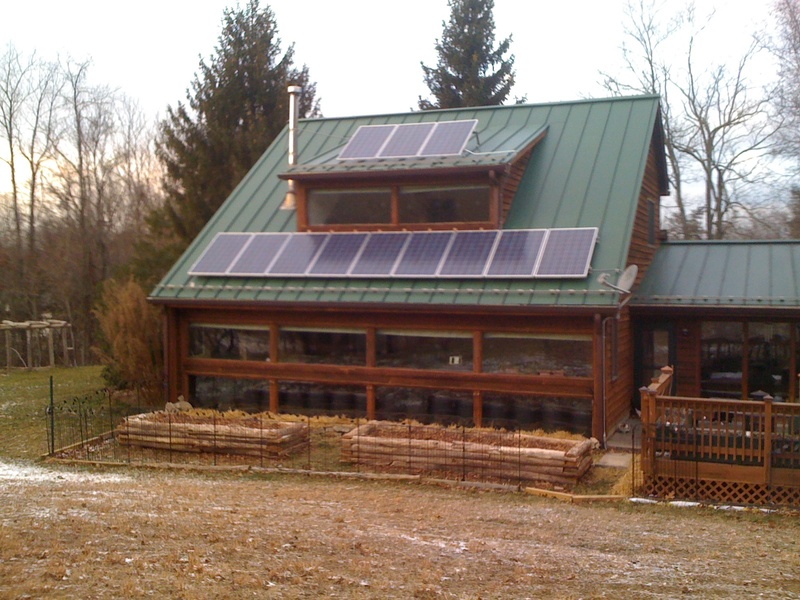 And this space is just part of a larger eco-friendly living concept in the mountains of Southwest Virginia. In this brief expose we’ll describe those workings and share the secrets of life as a modern day “settler.” While the job of furnishing the apartment portion is incomplete at this time, and new possibilities emerge on a regular basis, we’ll tell you what we have so far with the promise of updating this article. Annie R. Pearce, Assistant Professor of Sustainable Building at Virginia Tech, has been the prime mover on this project, while Larry and Susan Pearce, her parents, have been her guinea pigs. Recently, they stayed on the premises for over three weeks, testing every aspect of the Granny Flat facility. We’ll introduce you to the various features and amenities of this small home, then consider it along with Annie’s Main House. Together, they’re known as “Radford Solar.” But first, let’s look at how it all came to be. After finishing her graduate studies at Georgia Tech in Atlanta nearly two decades ago, Annie accepted the position of Assistant Professor in the Myers-Lawson School of Construction at Virginia Tech. Her devotion to this job soon earned her Tenure, where in addition to teaching, she could conduct research, assume administrative roles, and pursue community outreach possibilities. 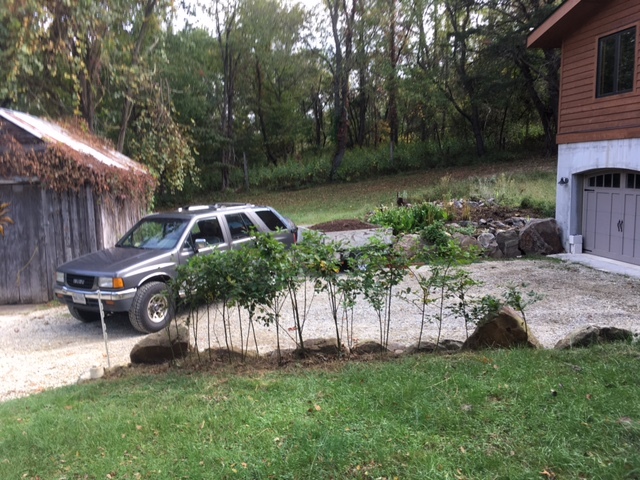 She had purchased 3-plus semi-wooded acres with house on the edge of the small town of Radford, VA. The residence, which we’ll call the Main House in this essay, was designed and built with many environmentally friendly features: a large sunroom, a wall of south-facing windows in the the Great Room, thermal curtains, water barrels capable of collecting heat from the sun when it’s low in the winter and transferring that heat to the living quarters, and more. Her first priority was to clean and make the seven room main house even more livable and efficient. She converted a downstairs bedroom into an office and replaced the aging woodstove and flue. 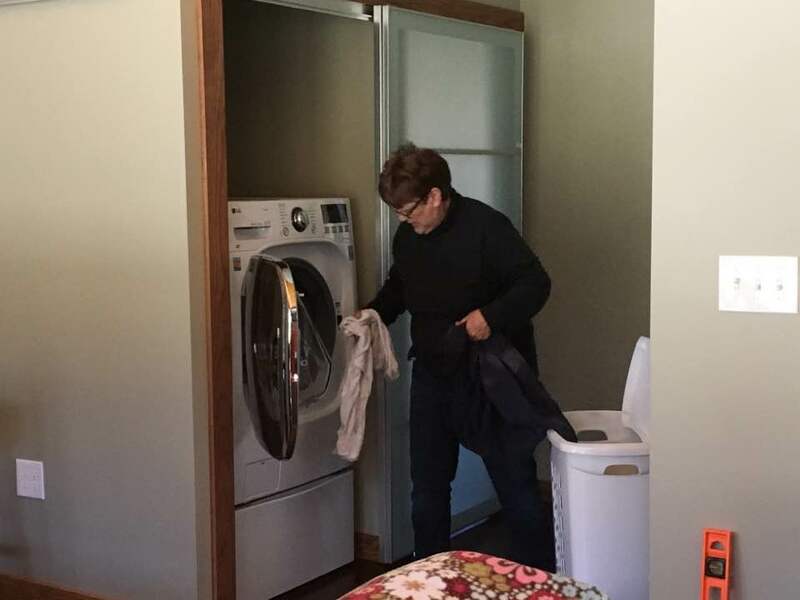 The older washer and dryer were exchanged for more cost-efficient ones. A more complete look at her early improvements can be found later. Annie carried all this out while conceiving a grander plan, which included an adjacent two-car garage with living space above. It occurred to her that all of that could be a grand experiment to coincide with her classes in sustainability. She consulted experts in many fields, including solar energy, rain water capture, and heat pump technology. Her designers and builders were mostly local, and as the planning, sketching, excavation, and foundational work was being completed, even more ideas to support sustainable living boiled to the surface. This goes without saying that costs were a factor to a burgeoning professional. A home equity loan was secured and tapped based on her ongoing needs and ability to pay. This is all part of what she hopes to share with her students once a thorough cost analysis is completed. Before we get into specifics of each room, here are some pictures and explanations of the early physical aspects of Annie’s experience. What follows is an approximate possible schedule in stages, had the garage foundation (underground) and second (ground) floor been built in a continuous fashion. Such plans are seldom practical, however. Unforeseen factors such as construction errors, weather, and availability of “men and materials” are not mentioned. What is shown in this schedule is a general and an ideal scenario. We can imagine that such “assembly line” systems work actually work quite well in the creation of traditional housing developments and large industrial or residential complexes with “cookie cutter” designs. SITE PREPARATION & STAGE 1 – Trees and shrubs cleared, survey taken, and stakes planted with ground markings applied for excavation. Digging for foundation with soil moved to rough landscaping around site. Ditches dug for footer and perimeter drains with wastewater piping and connections to the municipal sewer line made. A loop to collect and disperse radon gas was installed but not vented at that time. Cement footer poured and bracing system begun to support foundation. STAGE 2 – Foundational NUDURA wall forms installed, additional bracing set for door headers, and cement poured. 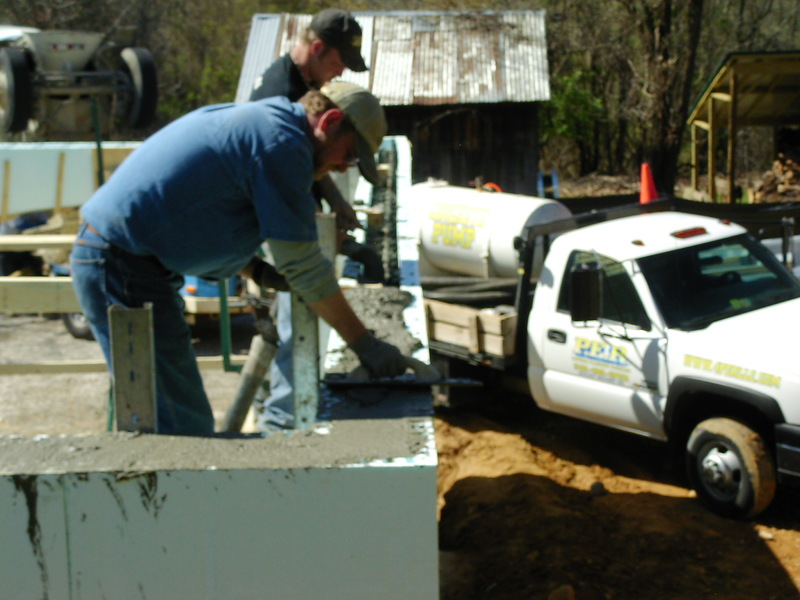 STAGE 3 – Foundation parged and allowed to dry. 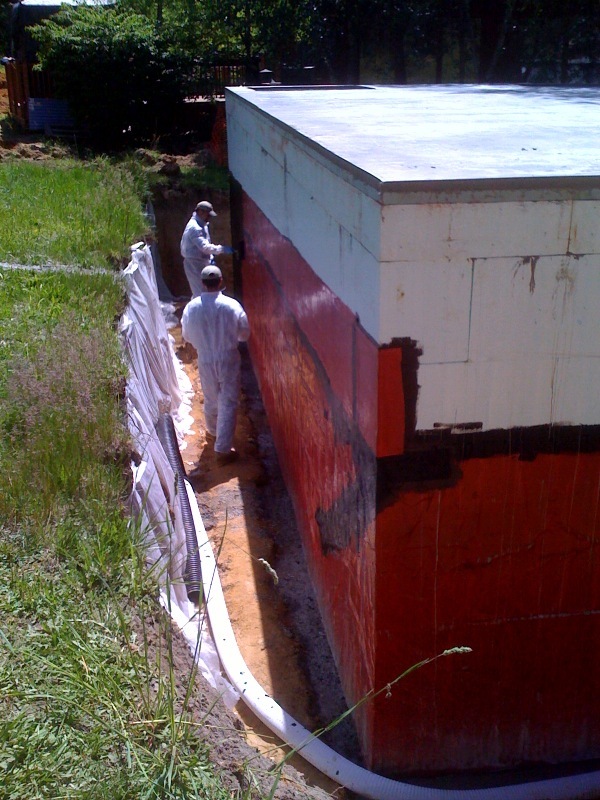 Area around foundation back-filled, tamped, and a reasonable amount of time allowed for settling. Cross beams set, ceiling pans attached, holes for plumbing, electric, and ventilation formed, and second floor poured and finished with heating tubes within. Garage floor with drain may be poured at any time. 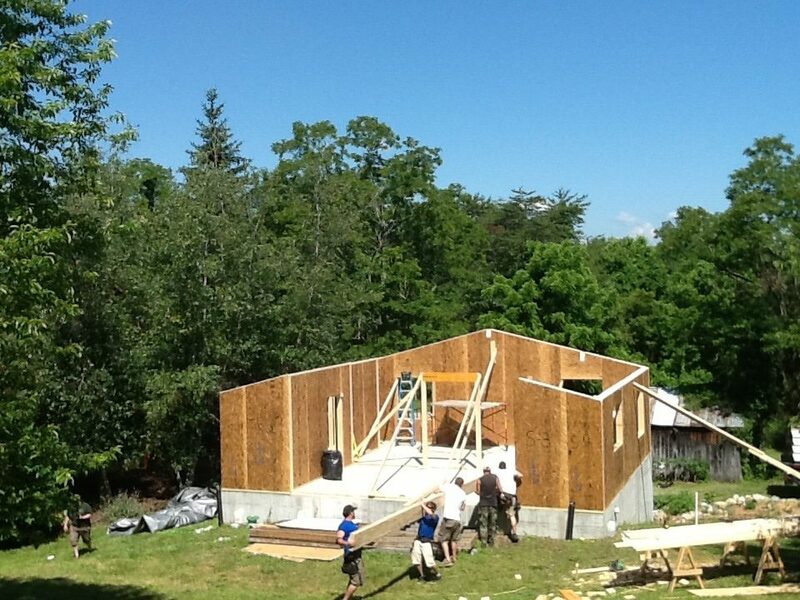 STAGE 4 – Exterior walls, support beams, and roof installed. The metal roof is installed over the roof panels. 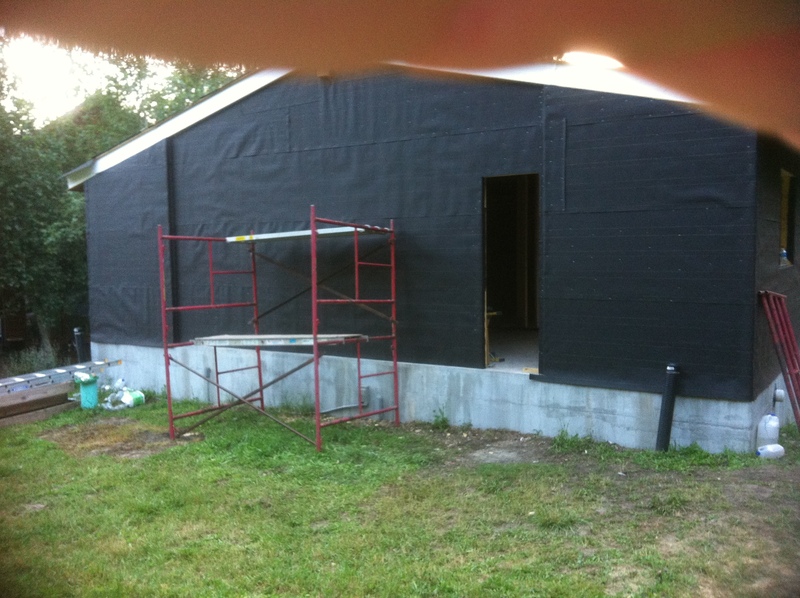 Thirty-pound felt material (tar paper) wrapped around the building with any insulation and siding. Siding hung. 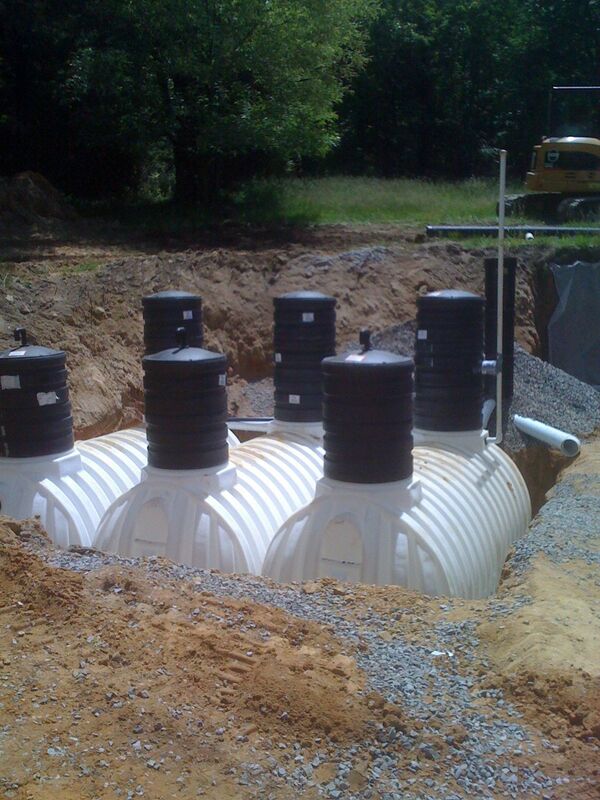 Gutters and downspouts will be installed and connected to the rainwater harvesting system after the roof is in place. STAGE 5 – Window and door openings, having been cut into the SIP* at the factory, and frames with glass installed, and necessary caulking was applied. 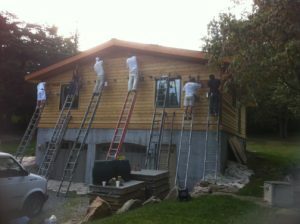 Exterior stained. 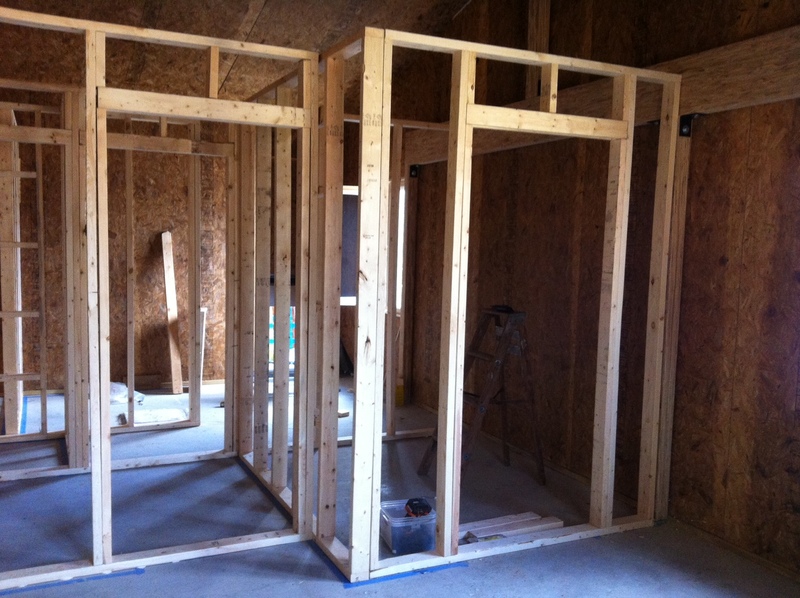 Interior framing begun at any time. La Catina window wall* and garage doors could be installed now, although Annie waited until later. 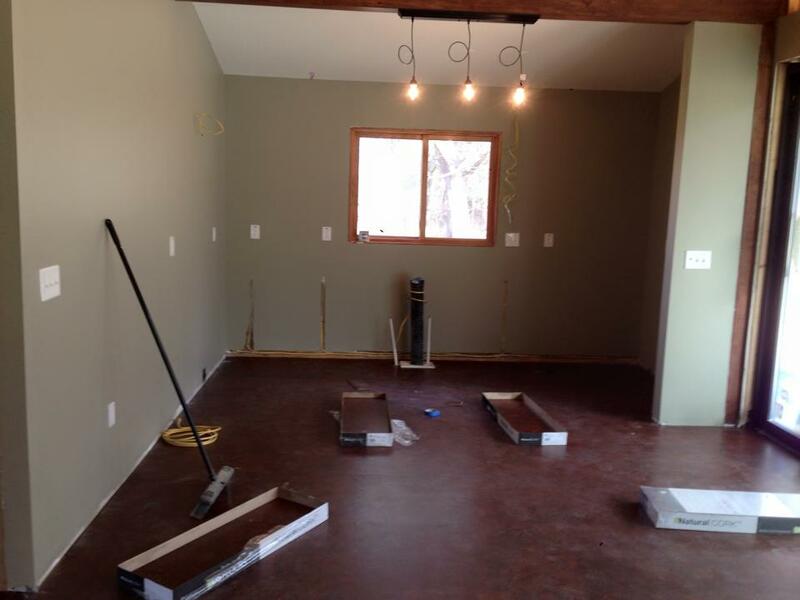 STAGE 6 – Electrical and plumbing services installed and dry wall hung and spackled. STAGE 7 – Interior painting finished. Flooring, trim, and bathroom fixtures installed. Kitchen and all home appliances installed. Shelves installed and doors hung. After the site for the Granny Flat was prepared, the foundation dug, and footer poured and dry, the wall forms were stacked and bracing set. 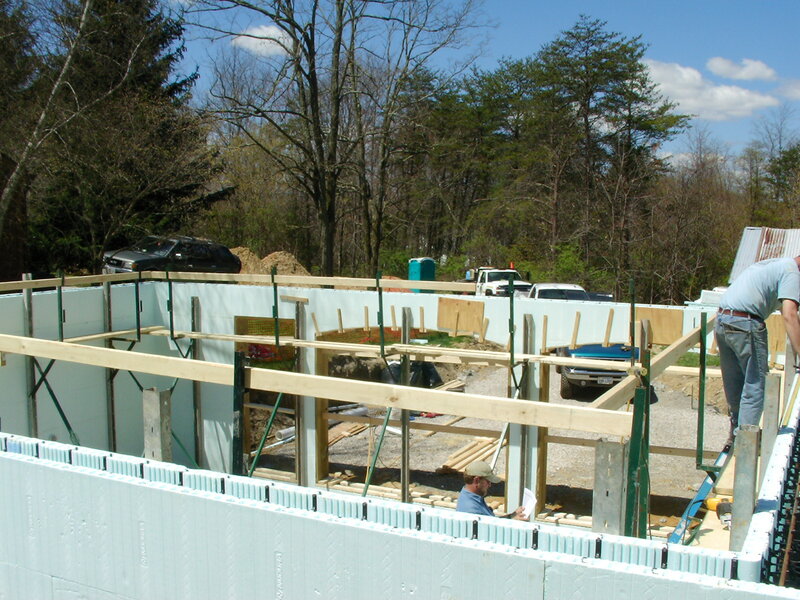 The EXTERIOR STRUCTURE of the garage downstairs is made with NUDURA Insulated Concrete Forms (ICFs*). These forms are made with hinged web connectors and can be shipped flat to the site, saving considerable transportation energy since 40% more panels can be shipped in a single load. The connectors provide a support system for reinforcing bars in the wall. NUDURA ICF blocks quickly snap together like Legos and are four-way reversible, meaning that installers don’t have to worry about how the blocks are oriented when snapping them together since they fit no matter which way they are turned. NUDURA also offers installer training for contractors wishing to use its systems. The resulting walls are braced during construction using a “tunable” bracing system that supports working platforms for concrete workers performing the pour. Construction of the wall forms is therefore extremely fast, and requires only removal of the bracing after the walls have cured. The forms stay in place to provide insulation, with a resulting R-value of 23.59. ICF walls can be faced with a variety of external finishes and are extremely damage resistant and thermally efficient. They also provide significant sound-dampening capabilities. The exposed exterior wall of this building is presently covered with a fiber-reinforced parging* but will eventually be covered with a stacked stone veneer finish. The sub-surface side is covered with a three-part moisture barrier including recycled content dimpleboard on the outside, and a surface-applied bituminous coating plus membrane on the inside. These finishes, along with an oversized perimeter drain system, help to keep the building dry despite being located in an area of high groundwater flow. The NUDURA system comes with a variety of prefabricated options, including curved wall sections, corners, brick ledge forms, and others, allowing a wide variety of designs to be accommodated. The GARAGE CEILING is a 4” reinforced concrete slab using recycled fly ash*, installed on a MetWood beam and stay-in-place pan form system. MetWood is a local company that makes this material-efficient system from cold-rolled steel to achieve large open spans and eliminate the need for interior columns in the garage space below. Tubing for in-floor radiant heating was installed during the original slab pour to allow for the addition of comfortable radiant heat for the apartment at a future point in time. The STRUCTURAL BEAMS AND COLUMNS supporting the roof of the building are engineered parallel strand wood beams. 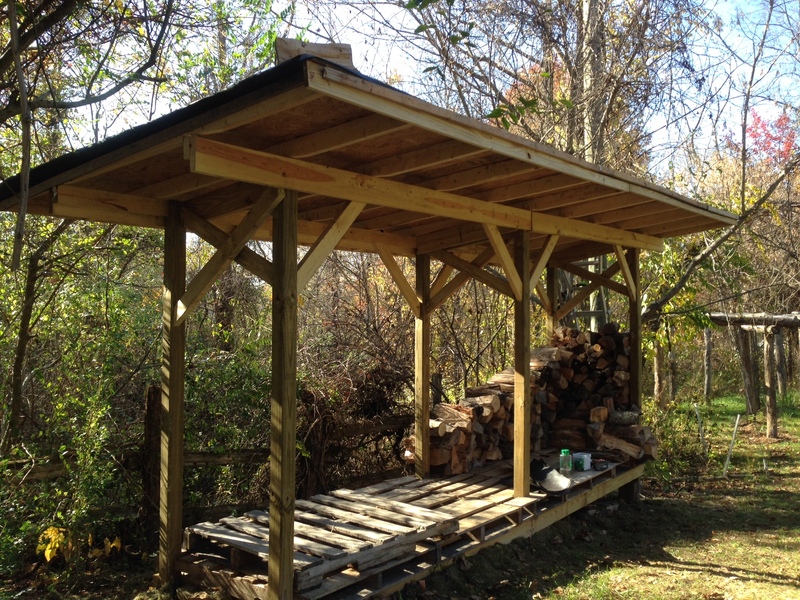 Much less expensive than the equivalent timber structure, these beams are made with waste wood from timber operations and smaller trees, held together by strong adhesive. The resulting beams and columns are consistent throughout and provide predictable engineering performance, unlike some natural wood products or recovered timber from other structures. The EXTERIOR STRUCTURE of the apartment upstairs is built with Structural Insulated Panels (SIPs*), made and installed by local manufacturer ACME Panel. ACME Panel’s factory is presently the only solar-powered business in Radford, supplied by a 30kW grid-connected photovoltaic array, and was the first solar-powered SIP manufacturer in the US. ACME also recycles nearly all of its manufacturing waste. 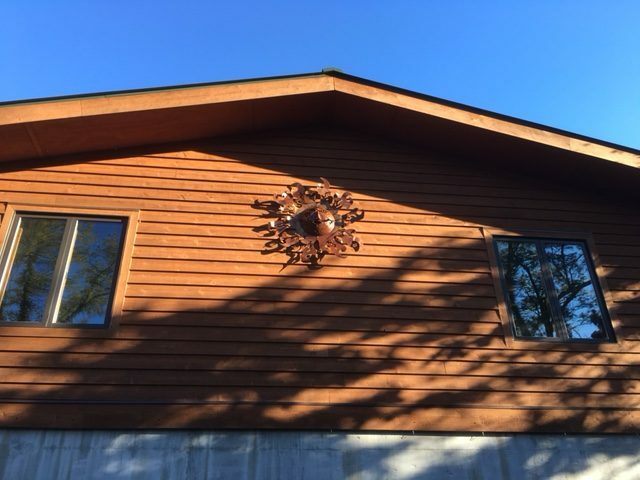 What a layman would call “tar paper” is really felt material and was installed under a layer of Cedar Slicker* and cedar siding the entire way around the building. This allows a drainage plain and ventilation path when the exterior gets wet. The photo below shows the temporary wall in the back, part of which was later removed when the folding La Cantina window wall* was installed. The SIP panels are made of expanded polystyrene (EPS) with oriented strand board (OSB*) face-bonded to each side with continuous glue. They allow for a thermally continuous building envelope that is extremely structurally efficient and high performance from an energy and comfort standpoint. Panels are joined together using surface splines*, and a vertical cavity at the panel joint is filled with expanding foam to ensure an airtight seal. The wall panels are 6-1/2” thick and are rated at R-24*, and the 10-1/4” roof panels are rated at R-40. All of the INTERIOR FRAMING except the main wall dividing the living/kitchen area from the rest of the apartment is non-structural and was built from construction waste wood used for bracing, blocking, infill and other purposes. Hidden spaces have been saved in many areas such as the kitchen storage closet in the hallway to maximize storage in this small apartment. The kitchen storage closet has OSB* backing to prevent potential damage to the drywall face in the bedroom. Most of the electricity for this building is provided by a 2 kW GRID-TIED PHOTOVOLTAIC SYSTEM* on the south-facing roof of the Main house. Excess power produced by this system is used in the main house, and any remaining surplus is fed back to the power grid using a smart meter that runs in reverse to account for actual power drawn from the electrical grid. Critical circuits including outlets, lighting, refrigeration, and the rainwater pump and treatment system are all wired separately and can be supplied by a portable generator in the event of power interruption. The portable generator used for this purpose is part of a HYBRID LAWNMOWER, the Raven MPV 7100, which can be used as an electric vehicle or gas-powered mower/generator as needed. The generator can also be used in remote locations to provide power for electric tools such as chainsaws and string trimmers, eliminating the need for gas-powered two-cycle engines that produce significant air and noise pollution. The WATER used to wash ones hands is 100% rainwater harvested from the roof of this building, treated to drinking water standards with a string filter, carbon filter, and UV* light to kill bacteria. While it is stored near the upstairs bathroom in a small conventional electric water water heater, the downstairs bath and the kitchen upstairs utilizes an ELECTRIC ON-DEMAND WATER HEATER* refurbished from a bathroom remodel in Philadelphia. The WATER SUPPLY PLUMBING is made from cross-linked polyethylene (PEX*), which allows for easy expansion and modification over time and can be connected with user-friendly fittings. PEX is also able to withstand freezing without damage, which has happened at least once in the garage space since the building was constructed. The filter housings in the water treatment system all broke during the heavy freeze, but the PEX plumbing survived without damage. The TOILETS are a high-performance, water-saving model from CaromaUSA [link] that meets EPA* WaterSense standards. Originally developed in Australia, this toilet uses a wash-down flush pattern instead of a siphon to move waste more efficiently with less water. Dual flush buttons allow one to use only the amount of water needed to…ahem…accomplish your task. The SHOWER STALL upstairs is a barrier-free shower for accessibility, with plenty of room to accommodate wheelchair users or people with disabilities who may need assistance while bathing. Blocking has been installed in the walls surrounding the shower and toilet for grab bars, although they have not yet been installed. The porcelain tiles in the shower and on the floor are durable and easy to maintain. A temporary low-flow showerhead is installed now, but will be replaced by a dual overhead/handheld unit in future to facilitate showering by people with disabilities. All faucet controls are easy to understand and operate by people with disabilities. The shower valve and trim are commercial-grade, providing years of trouble-free service. The porcelain BATHTUB downstairs was purchased as a damaged item at Lowes. It has a cosmetic dent but otherwise serves the purpose of this utility bathroom just fine. The cavity beneath the tub is filled with expandable foam to provide a thermal barrier and retain heat should it ever be used for bathing. The SHOWER HEADS in both baths are low-flow models. The WASTEWATER LINE from the upstairs, including the shower, bathroom sink, and washing machine in the hall closet, were laid out such that greywater* from these sources could be diverted in future for use in landscaping. The wastewater plumbing downstairs, having been installed before the diversion system was set, uses a straight run of pipe into the municipal sewer. Water from the kitchen sink and possible future dishwasher are typically not suitable for recycling because they may contain residue from animal products such as meat and fat. Obviously, toilet water is not repurposed outside of municipal facilities. The TUB SURROUND is made from corrugated metal roofing to provide an affordable, durable industrial look. The TILE for the sink backsplashes and tub valves is made from recycled glass. These were recovered tile samples from Eco-tile that were given a second life as a decorative accent. The solid surface COUNTERTOPS AND SINKS were purchased from the Habitat for Humanity ReStore in Christiansburg. The sink faucet was purchased used from the contractor who installed the plumbing. The PAPER TOWELS and TOILET PAPER are recycled content. Paper towels placed in the brown paper bag next to the trash can are composted in an outside bin regularly. For sanitation purposed, toilet paper must be flushed and not placed in the trash cans. Non-compostable waste is placed in the trash can. The POCKET DOOR to the bath downstairs allows a full-size bathroom to be fit into a small space without compromising the ability to park a car in the left bay of the garage. Pocket doors are incorporated throughout the building to save space. They are also more accessible to people in wheelchairs, although the door opening to the bathroom downstairs is too narrow to allow a wheelchair to pass. The door downstairs was purchased used from the ReStore. The sliding doors in the upstairs of this building are repurposed IKEA wardrobe doors. The LIGHT FIXTURE and MIRROR above the sink in the downstairs bath were both recovered from the Main House master during remodeling. The light fixture there contains compact fluorescent lamps, which are more efficient than the original incandescent lamps. The RECESSED LIGHTS in the ceilings above the tub and showers use LED* bulbs rated by EnergyStar*. These and those elsewhere in the apartment fit into high-efficiency LED fixtures. These extremely shallow fixtures were selected especially for use in this building because they can be installed without needing extensive clearance or cutting into the building’s thermal envelope. This eliminates the need for extra framing to create a cavity for the lights. SHELVING in the bathroom closet (not yet installed) was recovered during the deconstruction of OakBridge Apartments in Blacksburg by Habitat for Humanity. The lighting fixtures in the closets are high-efficiency LED fixtures custom-fitted into standard electrical boxes by the electrical crew. After installation of dry wall, spackling, and paint, the entire floor upstairs in the living room, kitchen, and hallway, which contains hot water radiant heating pipes not yet supplied with an hydronic boiler, was covered with engineered cork planks. The They provide comfort, warmth, and ease of cleaning. The bathroom has porcelain tiles, and the bedroom is covered with feet-warming carpet tiles with structural backing. For now, the upstairs Granny Flat space is warmed using portable electric space heaters, which because of the thermal efficiency of the building, are only needed several months out of the year. Annie’s first kitchen addition was an energy-saving side-by-side refrigerator with stainless silver finish. The best part is that the 4-door model has the freezer compartments on the bottom. Other features include a cheerful alarm to announce when the doors have been left open for more than four minutes. Something completely new to this gentile family is the “Sabbath Observer.” For strict Jews and other faiths, somehow the refrigerator knows when it’s Saturday, and the lights are extinguished in compliance with religious laws and practices. As for the rest of the kitchen, Annie is still in the planning process. 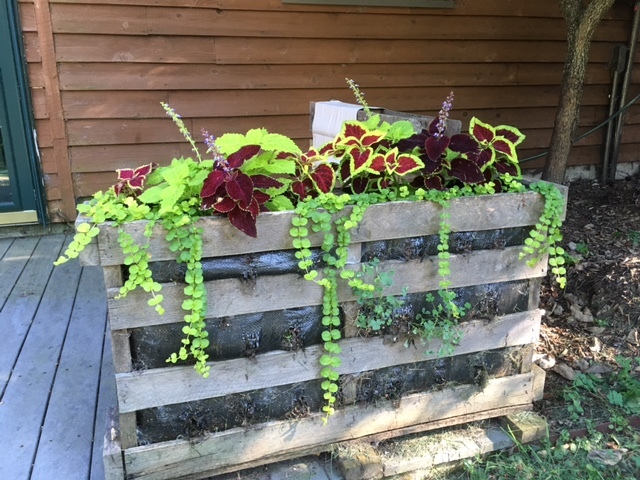 She acquired any number of recycled and used countertops, a sink, and faucets at the Re-Store to install on top of strategically placed wooden packing crates obtained locally on Craig’s List. The plumbing was hooked up and the sink-countertops secured to the wall, all temporarily of course. To round off the smart kitchen, Annie found a clean manufacturer refurbished microwave. The handy toaster oven is new. Like the Great Room in the Main House, the living room enjoys the ventilation of a vaulted ceiling and the warmth of the morning sun. Added comfort was added with the addition of an oriental rug and glass coffee table in front of a love seat and futon. The latter is available for overnight guests. The La Cantina window doors *(see photo above) may be opened nearly the full width of the room three months out of the year. This expands the room by 8 feet. A fine screen around the entire porch is primarily for insect control, but it also keeps direct sun and unwanted particles in the air from overheating and soiling the room. An unexpected test of the screening came when one of Annie’s cats successfully climbed the porch’s exterior without damaging the tightly fastened material. Annie plans to install blinds over the window to keep heat out in the summer and cold out in the winter. The window coverings will also provide a measure of visual security. The bedroom area comfortably holds a double bed with plenty of room for a night stand, a desk, and even a dresser, although the spacious walk-in closet hosts all of the shelving and racks a retirement couple could need for clothing and accessories. During the recent stay in the Granny Flat, Larry did his computer-based research and writing off a large glass desk here. Susan had plenty of room to dress and show Chia, the cat, the semi-wild feral kitties out the windows. Two added features of the bedroom are the voluminous bookshelves above the entryway and drop-down door to the attic storage compartment, both accessible by a sliding library ladder. Imagine the possibilities in adding appliances, conveniences, and entertainment devices to this example of sustainable living. Annie began with an LG washer-dryer combination* upstairs off the hallway between the bathroom and the living room. Using a minimum of electricity, ready to plug into a 110 ac outlet, connect to any faucet, and drainpipe, the high capacity unit washes, spins damp, and dries clothes without an exhaust pipe using the same principle as a dehumidifier. Any water collected is sent down the drain without raising the humidity in the house. 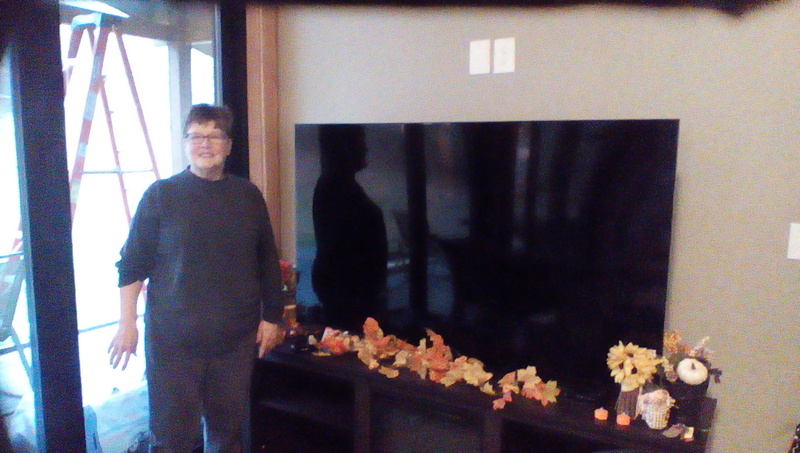 What would a modern retirement home be without a large smart TV, hooked to DISH* and ROKU*? Lots of audio and music services are available. And this set can also retrieve local digital channels over the air. Recording capability is supplied from Annie’s primary DISH unit in the Main House. As if that’s not enough, the TV stand in the Granny Flat has its own virtual fireplace to light up and warm the room. While the dish and over-the-air TV need hardwire connections, ROKU, computer access, and Ooma*, voice-over-internet protocol (VoiP*), are all wireless (Wi-fi*), or available everywhere from the garage to the back porch. 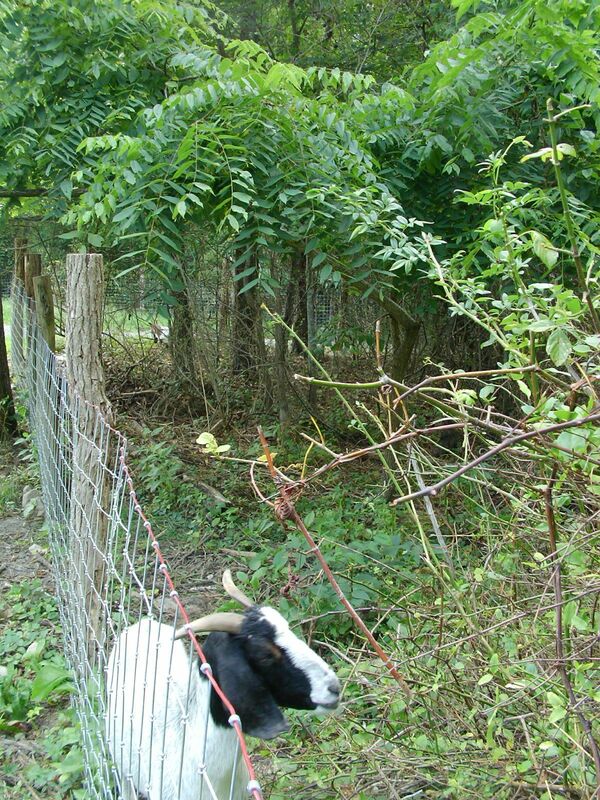 Let’s look at the sustainable improvements Annie made to her home over the past decade or so. While wildlife is wonderful in their place, Annie has had a problem with woodpeckers having lunch on the bugs that take up residence in the wood siding. When the time came to re-stain the siding, she had a contractor remove what insects they could find, fill and caulk the openings, then stain and reseal the outside. All this after she replaced all existing casement windows, some of which were broken, including the expansion of two window with larger ones. The bigger openings allowed more light in and wider views in her upstairs bedroom and downstairs office. Made of low-e glaze glass* in fiberglass frames to reduce thermal bridging, they are highly energy efficient. 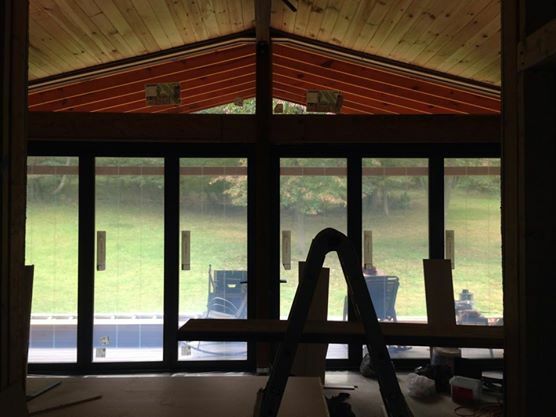 Mature birch trees on the east side of the Main House were kept in place to provide shade for the sunroom. An added benefit was maintaining the habitat for birds living just outside Annie’s bedroom. Large spruce trees were preserved on the north and northwest sides of the house to keep it shielded from prevailing winter winds and the hot afternoon summer sun. A new side patio made with permeable Gravellok* paving and boulders provides additional leisure space while allowing water to reach nearby tree roots. The old, degraded asphalt shingle roof was replaced with a high albedo standing-seam metal* roof. This, of course, before the solar panels were installed and after the new woodstove flue was in place. See above for the particulars on the solar panel electric generating system. When the existing original air-to-air, low efficiency heat pump failed, a high-efficiency ground source geo-thermal system was installed by professionals. 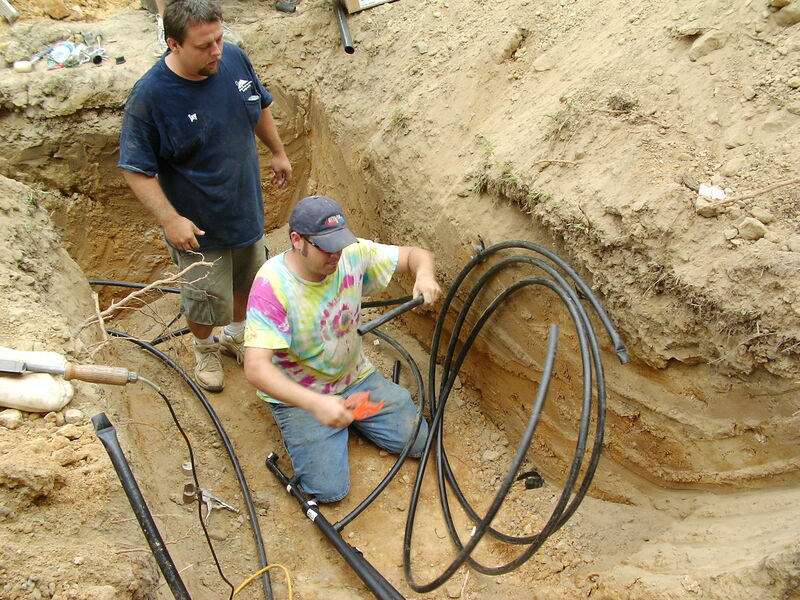 The 6-foot deep ditches contain two 285′ loops of tubing, the second one at a depth of four feet. [link] Connections provide aid to a conventional electric heating and air-conditioning system in the Main House. Water, circulating through the earth at 55-degrees, is pumped into the furnace room where it is raised to perhaps 68-degree in the cooler months or asked to carry excess heat off in the summer months, all minimizing the cost of comfort. The system is controlled by a programmable thermostat. 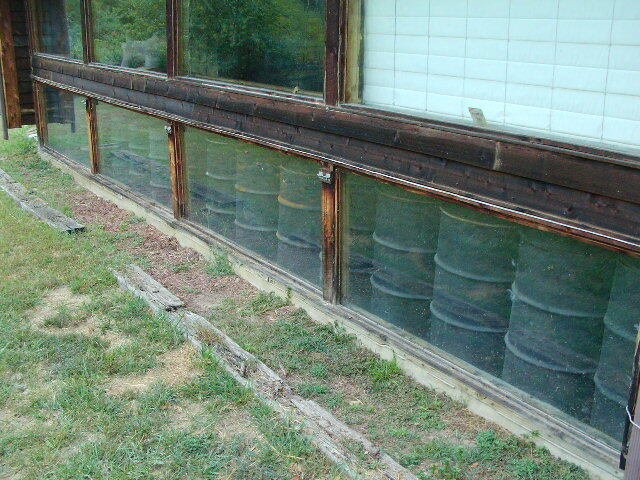 An array of plastic barrels filled with water sit side-by-side under bricks on the south side of the Great room. As the low-angled sun skims along the horizon in the winter, the barrels are heated and, in turn, radiate the heat into the residence, with the help of a thermostatically controlled fan. In the summer, the sun is too high to affect the barrels. 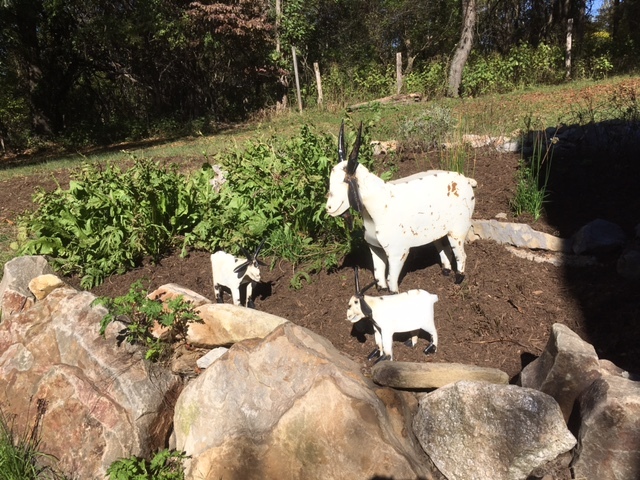 Also, Annie has a flower garden shielding the array in those months. Annie’s EPA-certified low emission woodstove in the great room not only provides instant warmth, beauty, and nostalgia but is an important backup in case of grid failure. She can heat water and even cook on its surface. Just beyond the side door is her wood shelter, built with scrap materials. Most of the fallen trees on her property are cut, split, and stacked there, keeping them dry for when they’re needed. Such wood heats several times, as the old adage goes: once when you cut and haul it, another when you split and stack it, and finally when you burn it. Upgraded ceiling fans were installed in all occupied rooms to circulate air and provide thermal comfort more efficiently. An automated exhaust fan activated by a motion sensor reduces air quality problems in the room housing the kitty litter. The interior of the Main House was painted head to toe with low or zero-VOC* (volatile organic compound) paints in soothing earth tones. In several rooms, she replaced the floor coverings with commercial grade carpet tiles containing either recycled content nylon face fabric or polyactic acid-based face fiber made from corn. The backing of these tiles also contains recycled content. They can either glued down or laid in place, making replacement fast and easy. Bathrooms in the Main House were both remodeled. Downstairs, a new vanity and cabinets made by a local craftsman from locally-harvested hickory. Countertops in both is polished Alberen soapstone harvested in Schuyler, Virginia. As the ones in the Granny Flat, the commodes are water-efficient dual-flush Caroma models. The low volume button releases only 0.8 gallons, and the high volume flush just 1.6 gallons per flush. The washdown flush pattern along with the 4″ trap help to ensure that the fixture never clogs. As in the Granny Flat, all existing lighting has been or will be retrofitted with energy efficient LED and compact flourescent bulbs. 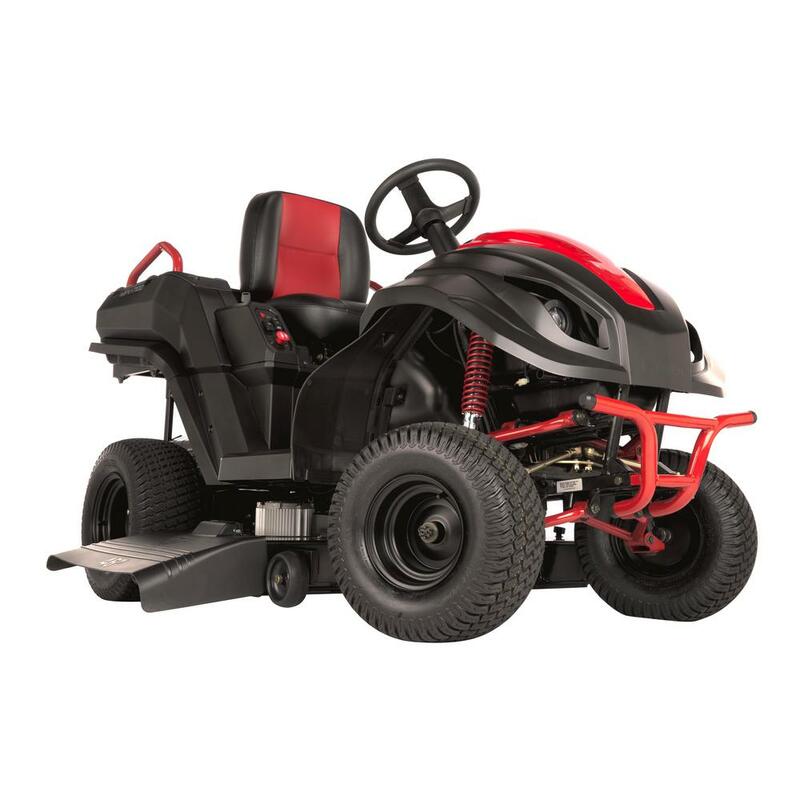 In addition to purchasing the previously mentioned multi-purpose LAWNMOWER, the Raven MPV 7100, which can be used as both portable electric generator and gasoline or battery-powered mower, landscaping fabric, edging, and organic mulch around perimeter of the houses were installed to reduce maintenance requirements in difficult-to-mow areas. 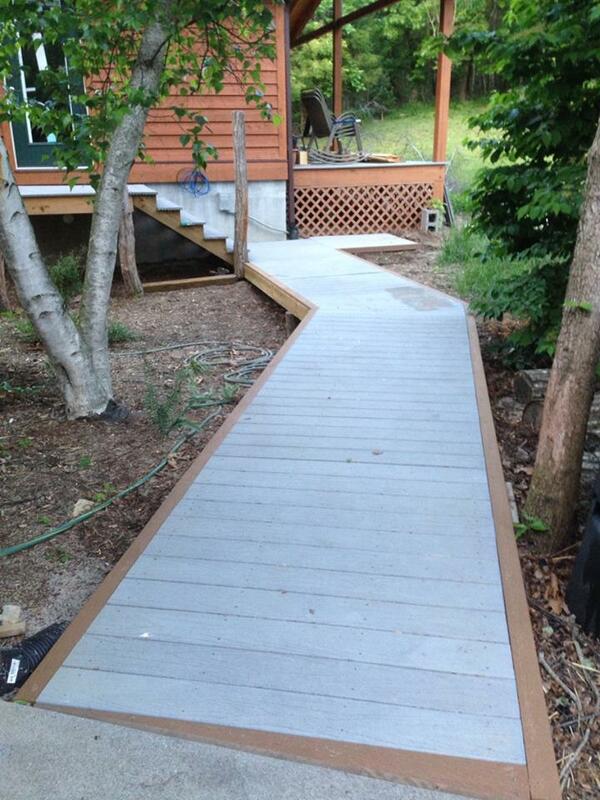 A raised walkway, or BRIDGE, between the Main House and apartment and porches were added to both structures. All surface materials were recycled plastic lumber. 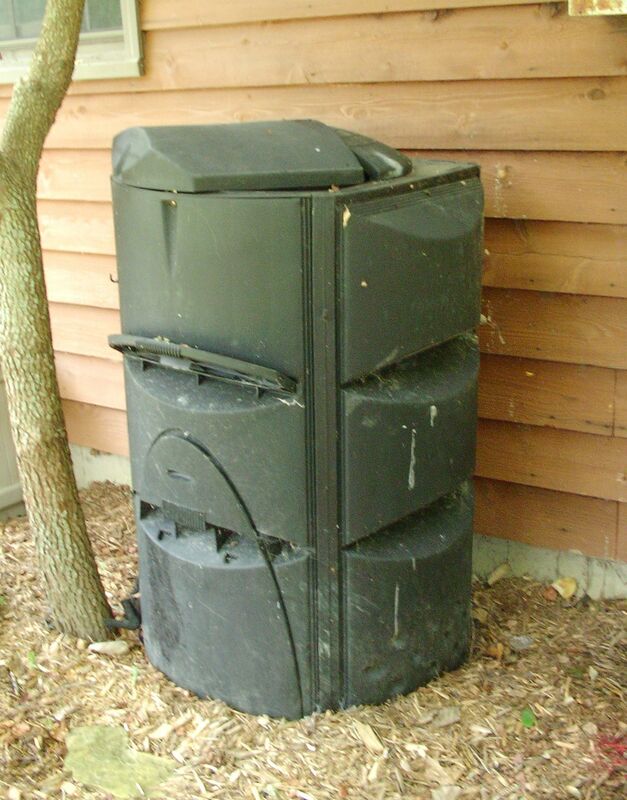 Three COMPOSTING UNITS to recycle food and yard waste were placed around the property. Resulting materials are then used as mulch and organic fertilizer in gardens. 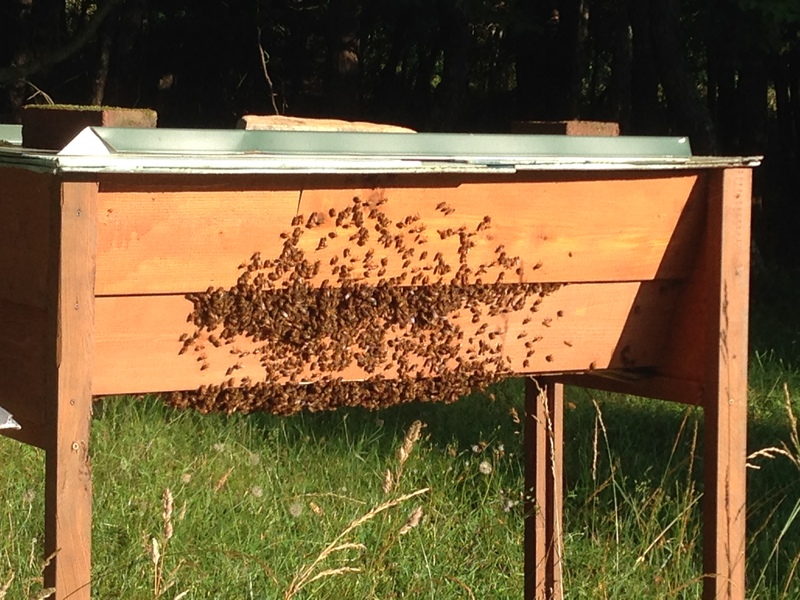 Three top bar BEEHIVES were placed on site, with mixed results over the years. Perhaps the insects couldn’t find enough nectar in this combination of woodland and suburban setting to meet their needs. The experiment continues. 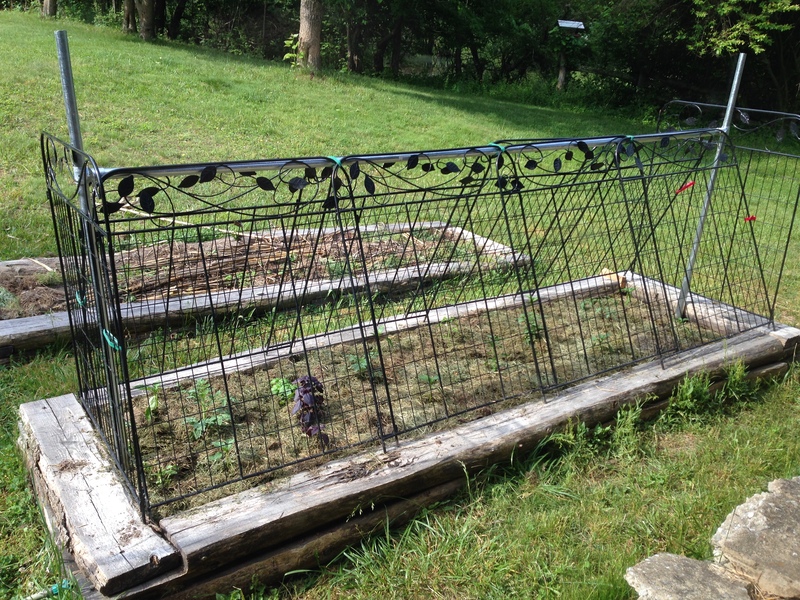 RAISED GARDEN BEDS were installed, made from locally-cut black locust wood, which has an expected service life of 75 or more years. The logs have no chemical additives, which assures the safety of produce for human consumption. Annie recently installed a previously owned vanity with sink in her sunroom to repot and plant flowers and garden starts. This is all in anticipation of building a greenhouse where the old storage shed now sits. The wood from that and used windows from the area will provide the perfect structure for husbanding green things for eating and enjoying. A semicircular PERGOLA was constructed, made from black locust, which presently supports three varieties of grapes and two varieties of kiwis. As the plants cover the sturdy trellis, a shady sitting area will be most welcome. FRUIT TREES were planted in the orchard, including persimmons, seven varieties of apples, blight-resistant pears, almonds, and cherries. 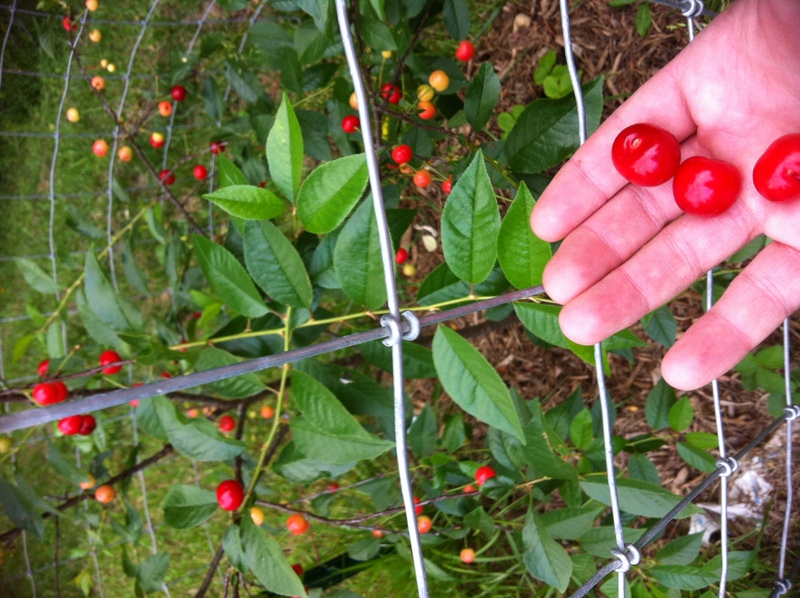 Two different types of wild cherries and black walnut trees already provide a harvest on the property. Multiple varieties of BERRIES have been added to the grounds, assuring an almost daily supply of healthy eating during the late summer months: strawberries, blackberries, blueberries, raspberries, gooseberries, lingonberries, cranberries, and elderberries. Meantime, others grow wild nearby: blackberries, grapes, and raspberries. 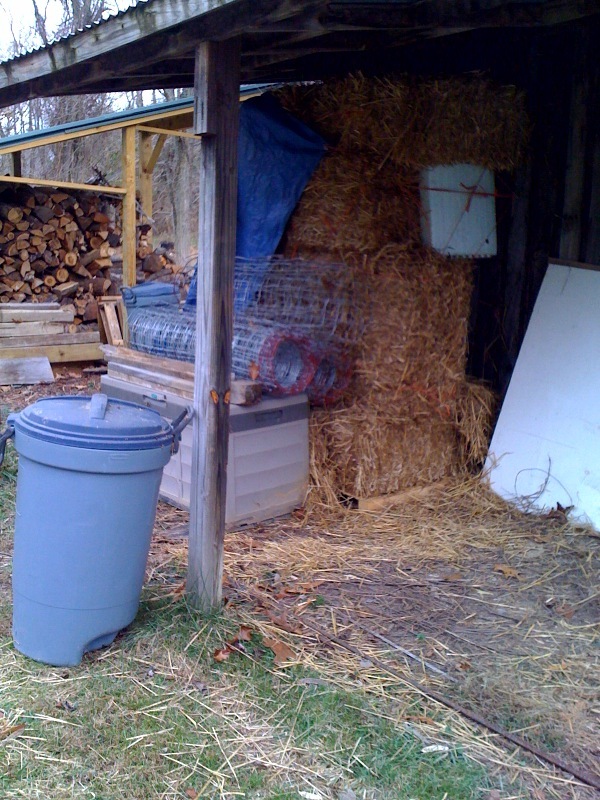 Multiple year-round shelters for local feral cats have been constructed, using mostly recycled barrels and boxes filled with straw. Periodically, the bedding is recycled and new is added. In the decade that Annie’s attended this project, over 35 animals have been captured, spayed/neutered, vaccinated, and provided housing. 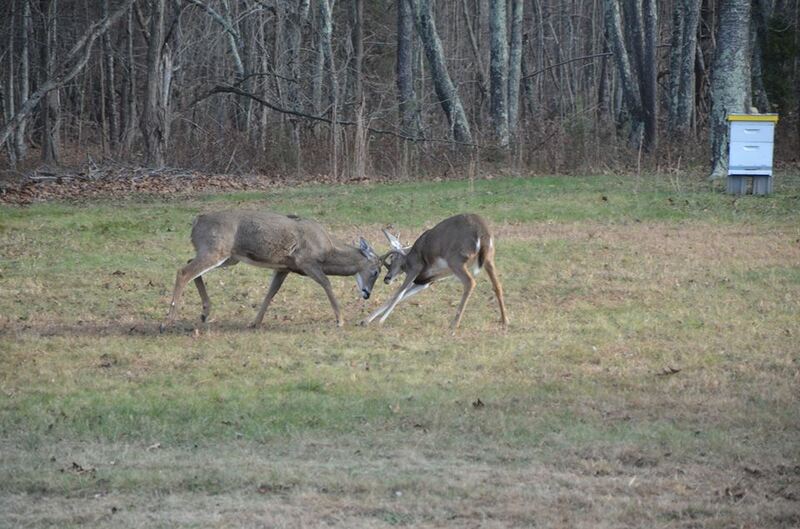 In addition to domesticated animals, residents and visitors to Radford Solar enjoy a steady stream of deer, turkeys, squirrels, and a variety of birds to the property. All are visible from the porches and windows at both houses. The wild creatures all have the added protection of the vast mountainous forest to the south. The buildings and surrounding property you have just visited represent truly remarkable technology and environmentally friendly practices. The best part is that real people have had the opportunity to actually live in these environs. And even better is the fact that improvements are being discovered and surely will be added on a regular basis. Larry and wife Susan have the option of spending their “senior” years in this wonderful place, and we love being “Guinea pigs” for our daughter. Meanwhile, she continues to research and teach sustainable building and offer tours for her students, family, friends, neighbors, and perhaps in the future, the general public. Certainly, the Myers-Lawson School of Construction at Virginia Tech in on the forefront of practical and eco-friendly living. We hope you’ll contact us through comments below, telephone, or e-mail with questions, suggestions, and ideas. Gravel-lok – Natural pebbles held together with a polyurethane binder, creating a durable, decorative, eco-friendly porous surface.